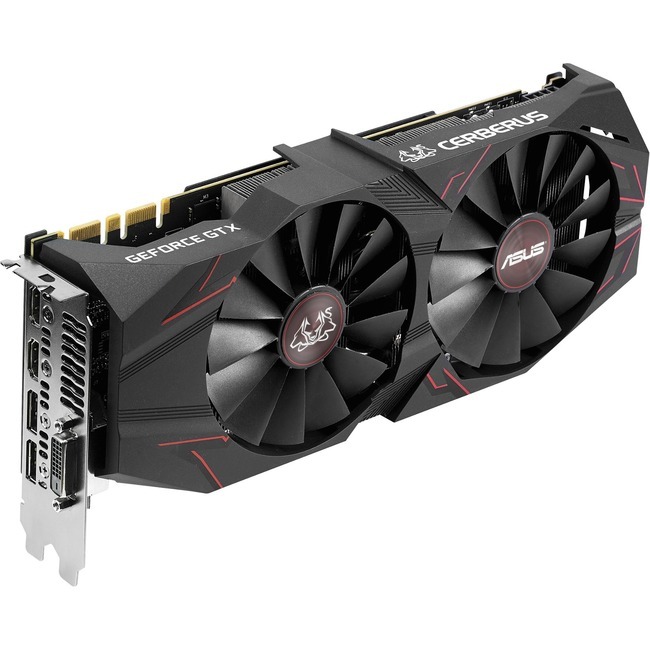 ASUS Cerberus GeForce® GTX 1070 Ti Advanced Edition 8GB GDDR5 with rigorous testing for enhanced reliability and performance. Extensively tested with the latest chart-topping game titles like League of Legends, Overwatch and PlayerUnknown's Battlegrounds. A strong metal backplate reinforces the circuit board and is a striking outward mark of Cerberus's role as a powerful guardian. ASUS Cerberus GeForce® GTX 1070 Ti is the high-performance graphics card that's engineered with enhanced reliability and game performance for non-stop gaming action. We test the card to the max with the latest games like CS:GO, League of Legends, Overwatch and PUBG, and carry out extensive reliability trials and heavy-load benchmarking for 15X longer than industry standards. Cerberus GeForce® GTX 1070 Ti is engineered with a strong metal backplate to both protect the sensitive components on the rear side of the card and provide reinforcement for the circuit board. This sturdy backplate is accented with striking red lines - a symbol of Cerberus's role as a powerful guardian. Our extensive performance and stress tests begin with the very latest chart-topping titles - like League of Legends, Overwatch and PlayerUnknown's Battlegrounds. We also carry out reliability trials that include a 144-hour diskless-system test and 3DMark benchmarking under heavy loading for 15X longer than industry standards.